D-NOTAMs are based on well structured event messages which are encoded in AIXM 5.1. Therefore they provide improved efficiency, data credibility and safety of NOTAM information and are easily interpreted by humans and machines. In order to convert a traditional NOTAM into a D-NOTAM we have developed the Digital NOTAM Gateway. 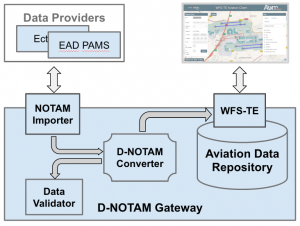 The Digital NOTAM Gateway imports text based NOTAMs and republishes them as AIXM Digital NOTAMs via a powerful WFS-TE interface. Among others, it is the perfect service for data portrayal, digital briefing and in-cockpit data visualization.